Some special European Grand Prix statistics do not belong in any category, but are certainly worth mentioning. 20 players got in the EGP final but did not win. Didier Piau, Dominik Nowak, Arthur Juigner, Jeroen Everts and Lari Pihlajapuro are the unfortunate players having this twice. Dominique Penloup played the most consecutive EGP tournaments (31) from Paris 1989 until Cambridge 1996. Takuji Kashiwabara played the most consecutive EGP tournaments and got points (18) from Copenhagen 2010 until Athens 2013. Takuji Kashiwabara got points in the most consecutive EGP tournaments he played (62) from Amstelveen 2008 until Aland 2017. This streak is still ongoing and started after a 14th place in Cambridge 2008. Nicky van den Biggelaar had 4 draws in the 2010 Alkmaar EGP which made him the only player with two losses and no play-off. Takuji Kashiwabara also played 4 draws in 12 games in the 2017 Athens EGP. Tough he registered all of them on day 1, meaning within 7 rounds! 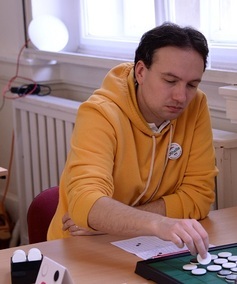 Roman Kraczyk was the first player who played EGP tournaments in all organising counties when the number of countries was 12. By playing in Moss EGP 2011, Roel Hobo, Takuji Kashiwabara and Marc Tastet also achived this. Roman Kraczyk and Takuji Kashiwabara were the first to play all EGP tournaments when Athens was added in 2013. At that time there were 13 tournaments. Moscow was added in 2014, but neither Takuji Kashiwabara nor Roman Kraczyk were present. Marc Tastet was, which brought him also on 13 different countries as well. In Aland EGP 2017, the first Finnish stage, Marc Tastet became the first player with European Grand Prix tournaments in 15 different countries. Takuji Kashiwabara was also present and brought his total to 14 countries. The best performance by two sisters (11.5) was achieved by Akke-lien (6) and Rosalinde (5.5) de Boer in the Ghent EGP 2009. The best performance by brother and sister (11.5) was achieved by Sido (6.5) and Jiska (5) Helmes in the Cologne EGP 2009. The best performance by parent and child (14) was achieved by Zdenek (5) and Miroslav (9) Voracek in the Prague EGP 2015. The best performance by two partners (17 points) was achieved by Albert Kortendijk and Linda Praseptyo (11 + 6) during Copenhagen EGP 2006. The best (and so far only) performance by three generations (15 points) was achieved by Leonid, Ilya and Michael Shifman (6+7+2) during Saint Petersburg EGP 2016. Imre Leader and Matthias Berg are the only players having won 3 tournaments with over 40 players. The final of Moss EGP 2011 was the first master final broadcoasting Takuji Kashiwabara and Imre Leader; two players with the highest number of EGP tournament victories (16 at that moment); battling for the sole lead. Cambridge EGP 2016 featured 20 European Grand Prix titles, spread over 4 players: Marc Tastet, Graham Brightwell, Imre Leader and Takuji Kashiwabara (see picture). Also Pragye EGP 2017 featured 20 European Grand Prix titles spread over 4 players: Marc Tastet, Imre Leader, Takuji Kashiwabara and Milos Cupial. The largest period between two EGP tournament victories is 13 years: Francesco Marconi won the Italian EGP in 2006 after winning hist last in 1993. The largest period between two EGP series victories is 16 years: Imre Leader won his fourth EGP in 2007 after winning his third in 1991. David Shaman (1996), Emmanuel Caspard (1998), Graham Brightwell (2005) and Michele Borassi (2008) scored the maximum available number of points. Takuji Kashiwabara and Miroslav Voracek are two players who have won an EGP tournament on their birthday. Tom Schotte (33 players), Marc Tastet (21 players), Roel Hobo (18 players) and Milosz Cupial (5 players) are the four organisers who have won "their" EGP tournament. 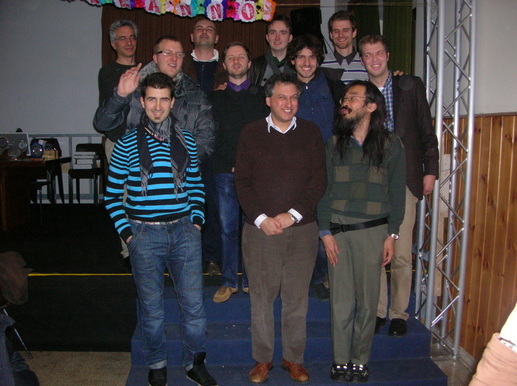 It appears that Imre is number 5 as he won multiple EGP tournaments that the organised: Cambridge 2002 (17 players), 2007 (23 players) and 2010 (24 players). Warsaw 2016 was the first tournament where all foreigners (exactly 4) ended in the top 4 and all local players ended outside the top4. Warsaw 2016 was the first tournament where the #5 only had 0.5 point less than the leader after 11 rounds. Aland 2017 and Brussels 2003 are the only tournaments with only 1 local player.